They keep 900 Dalesbred ewes and 250 Texel-cross ewes on the 1100-acre upland farm, and Richard runs a MV pedigree Texel flock under the prefix of ‘Crimple Head’ focusing on breeding shearling rams and females for the commercial and pedigree markets. Two working trips to New Zealand led to the introduction of 50 New Zealand Romney shearlings last Autumn - Richard was impressed by the breed’s mothering ability and hardiness to lambing outdoors on minimal concentrate feeds. 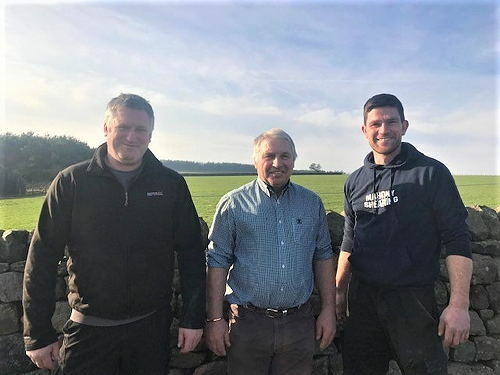 The Wilson family were seeing little benefit from using a mineral drench on the ewes, so started using Animax’s Tracesure boluses on their sheep and cattle six years ago. Tracesure Sheep with Copper is given to all sheep apart from Texel’s who have the non-copper version. “Giving a bolus is a vital part of our flock management. We use a trace element leaching bolus on all animals pre-tupping in September, and again pre-lambing when housing , alongside a 10-in-1 sheep vaccine to minimise handling time. The replacement females all have a bolus, as do the female hoggs which over winter on a neighbouring farm which seems to help with body condition while away. “Giving both cattle and sheep a leaching trace element bolus ensures a slow release of the essential trace elements selenium, cobalt, iodine and copper over a period of six months. Ensuring the stock is nutritionally prepared for the demands of upland farming will give returns on body condition, milk yield and good carcasses. “We finish as many of the sheep on grass as possible, which is why it’s important that the trace element levels are right. We judge each year separately. If they’re a long way off, we’ll sell them liveweight as stores. We try to be flexible.